Many university campuses have interesting buildings and landscaping but lack a compelling physical presence. Tucson architect James Gresham says we’re fortunate the University of Arizona possesses an image that is memorable for alumni, students, employees and the public alike. At the same time, he questions whether that image is about to be altered as building conditions change and more emphasis is placed upon a trendy new look. 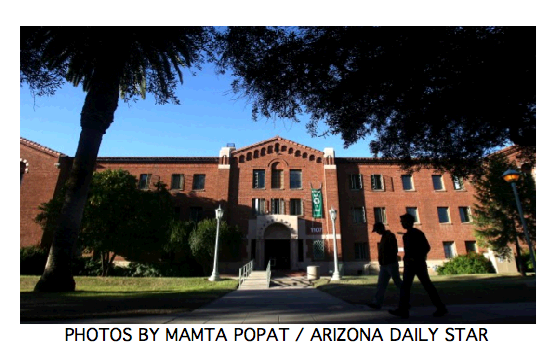 Today, as thousands visit the university during the final day of the Tucson Festival of Books, Gresham examines the beauty of UA’s red campus and its future. When I speak about the Red Campus, I do not refer to campus politics, rather what makes the physical environment of the University of Arizona campus so beautifully distinctive from any other large campus I know. A few years ago, I was teaching a class in the College of Architecture. on the way home one evening, I was walking across campus to my car. It was fall with the long shadows of late afternoon. I entered the University Mall immediately west of the Student Union – the beauty and vibrancy of the view was breathtaking in the fading light! It was a scene of many informal activities, among them Frisbee, football, jogging, all framed by the large monumental buildings that face it. I had the distinct feeling of being in a very special and unforgettable place. When you’re flying in and out of Tucson, the red color of the campus can easily be seen, but surrounded by a sea of urban mediocrity. The campus is the result of more than 100 years of erecting buildings, both large and small, from local red brick. Many architects and planners question this tradition (but alumni seldom do) and continue to propose alternatives in the name of an ill-defined notion of progress. The campus must be one of the most beautiful major campuses in the country, but it is not the product of some Olympian scheme. It is the unforeseen result of the very happy marriage of tradition with pragmatism. It possesses a visual cohesiveness that is remarkable in that it occupies nearly one square mile of prime urban real estate. Invariably, its near uniform red coloration reminds one of other places that are known for their color and uniformity of architectural expression. The red brick of Albi in France, the burnt ochre of the heart of Rome, the golden stone of Salamanca and the “Pink City” of Jaipur come to mind. There are other factors that have largely contributed to the elegance of this campus in addition to the almost universal use of red brick. The original campus, barely 30 or so acres on its west side, is composed of a remarkably lovely group of late 19th- and early 20th-century red-brick buildings of both territorial and various European styles, all beautifully human-scaled. This area is now endowed with mature and verdant vegetation and its buildings have established a very high benchmark for all later campus development. Undoubtedly, it is the most beautiful and charming part of the campus. Another factor is the extension of the “mall” to the east by Richard Houston, the facilities director and the Robert Moses of much postwar campus development and probably the father of the Mall as we now know it. In the mid-’50s a rudimentary mall extended no farther east than what is now the Joseph Wood Krutch Memorial Garden. The major extent of the mall, therefore, is very recent, indeed. A mall is the most traditional and potentially the most authoritarian of planning ideas. It is fraught with danger and in the wrong hands, as it was with Mussolini but not with L’Enfant, it can prove to be a disaster. Fortunately, the UA lucked out. The boxy buildings that line the mall do not alone constitute any sort of visual clarity, and with too few exceptions any memorable design quality, but the Mall itself and the prevailing coloration of red brick, certainly does. This harmony seems to prevail despite recent adventures into the use of much newer materials and seemingly alien colors of dark gray, black and stark white. Nonetheless, if this well-intentioned departure continues, the spell of the “red campus” may be irretrievably lost. Campuses are phenomenal creations that are far more important than their individual buildings. Usually, they are created over many decades and they are a historical text about our changing culture, our dreams and our spirit. Sometimes they are a microcosm of an urban and community life as we might want it to be. The University of Washington possesses a great plaza at the very center of its campus that is framed with both old and new buildings – effortlessly it recalls the piazzas of Medieval and Renaissance Italy. The Romanesque Main Quad at Stanford is a vision of an idealized European academic community that has boldly been transported to coastal California. When traveling, I always seek out the nearest university or college campus. Usually, it is there that you will find the best buildings and the best public spaces. My favorite is the Cranbrook School for Boys that actually is only one part of the Cranbrook Educational Community near Detroit. Since the late ’40s I have been there many times and my admiration for the place never wanes. It was imaginatively designed by Eliel Saarinen in a soft colored red brick and stone and was completed in 1928: It is a consummate early modernist channeling of the perfect academic environment often associated with English schools and colleges. The perfection of the Boys School does not easily translate to a large campus like that at the University of Arizona. Nor should it. Eero Saarinen, Eliel’s even more famous son, once said that one should “always design a thing by considering it in its next larger context – a chair in a room, a room in a house, a house in an environment and an environment in a city plan.” In an ideal world new buildings upon any campus should perhaps adhere to this simple idea of context and accommodation. A remarkable pattern of new buildings immediately adjacent to older ones at the UA has developed south of the mall and to the east of Herring Hall. The pattern was probably first established by the construction in the early ’90s of the Marley Building immediately adjacent to Herring Hall, to which it is connected, and also in very close proximity to the Forbes Agriculture Building. This densification of the campus has now been successfully adapted to the adjacent chemistry complex of old and new buildings, including the new Chemical Sciences Building. The result is an intimate and very compact grouping of buildings and a pedestrian’s delight. The area is unlike any other part of the campus. New and old structures are seen immediately adjacent to each other. There is a marked visual engagement of buildings from different and distinct periods of campus development. The chemistry buildings are linked by bridges at the second floor, a device that helps to define the open spaces between buildings. It is not possible within this fascinating building group to experience a building isolated and frozen in style or manner; each can only be seen in reference to other buildings built earlier or later. It is a building pattern that has rich potential for a becoming academic atmosphere and for the conservation of valuable real estate. The construction of the most recent buildings on the campus, particularly those facing the Mall, such as the Stevie Eller Dance Theatre and the Meinel Optical Sciences expansion, both beautiful demonstrations of architecture as an art, raise important questions about the future development of the campus and the continuance of its visual cohesiveness. They are beautiful but self-referential buildings; they would be beautiful buildings anywhere, whether here, Kansas, New Jersey, or even the outskirts of Tunis. These two buildings have been described as having been built in the “post-brick” period, a worrisome appellation that I find much too facile. Those elements that particularly distinguish the campus should be the overarching theme for any new construction. The coloration of the buildings, the landscaping and the preservation of the Mall as a unifying structure are critically important. The building styles of the early part of the campus vary from Territorial to Italian Renaissance, therefore a contemporary building needs only to “fit” to be an enhancement to its surroundings. The issue of fitting is not a matter of style: It is a matter of the harmony and the enrichment of a beautiful campus fabric that is now more than a century old. While recognizing this principle, perhaps future development of the campus can happily synthesize that history and tradition with newer forms and modern expression. Frank Lloyd Wright was once asked to design a small palace on the Grand Canal in Venice. His elegant and markedly appropriate design, while very modern, was the product of Wright’ s love for Venice that he reinterpreted into a modernist vocabulary. It was never built because of public opposition – and that is too bad. Perhaps it would have convincingly shown that with the exercise of sound judgment in the choices of materials and colors and with the proper recognition of human scale, that the new and the old, at even the Red Campus, can live together quite well. Jim Gresham is a Tucson architect who has had a private architectural practice in Tucson since 1968. For nearly 10 years he was on the faculty of the College of Architecture, now the College of Architecture and Landscape Architecture. He is a recipient of the Rome Prize in architecture and has received more than 40 awards for design, mostly for public buildings located in Arizona. Among those are the Arizona State Office Building, downtown, and the Integrated Learning Center at the U A.